No shop would be complete without a reliable reciprocating saw. Basement DIYers and professional contractors alike recognize the versatility of this tool in just about any area and would not be caught without one. To help you figure out which recipro saw to go for, we have decided to put together this brief guide. We’ll talk about some of the best saws available today and give you a few other options if our choices don’t quite sound right to you. When we were taking our first few steps towards professional remodeling, we did have our fair share of encounters with reciprocating saws we thought were great but ended up disappointing us after just a couple of uses. This is because the true value of a reciprocating saw goes way beyond its name and design. You have to look closely and see what features it has. You have to listen to what other consumers think and what their experiences were like with each product. Now that we have used more than enough reciprocating saws to last a lifetime, we have discovered some key product features that are guaranteed to make a good saw. We decided to give the top spot to the DCS387B because of the versatility, power, convenience, and durability it offers. It works equally great in light cutting jobs and in heavy-duty work. Moreover, it is able to do cutting techniques that many other saws can’t quite pull off. It also has a bonus feature of an LED that illuminates the work area. 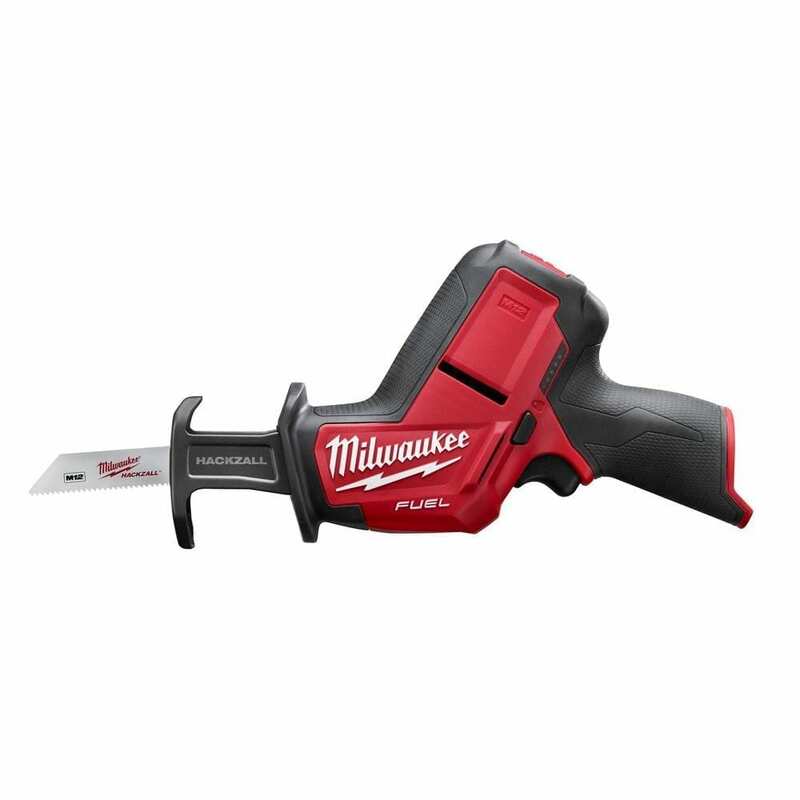 Weighing merely 4.4 pounds and measuring 13.4 inches long, leading power tool manufacturer Milwaukee’s 2625-20 M18 Hackzall is a compact and lightweight recipro saw. Because of its built, it is highly portable and comfortable to use even when cutting overhead and at other odd angles. It has variable speed control that lets you freely adjust and match the material you are cutting. Its stroke length is optimized for making precise and fast cuts on various material types. Milwaukee also added a few nice touches to this tool, such as the LED and the anti-vibration system. What we like the most about this saw from Black+Decker is that it does not attempt to be many things. It is a neat little saw designed and built to be lightweight and compact while producing a lot of power that can handle many light to moderate cutting operations. It also comes fitted with handy ease-of-use features that may appear insignificant on paper but help a lot on the worksite. Reciprocating saws are most commonly known for and used in demolition work. If you see anything that needs to be taken down or completely destroyed, you need to have a reciprocating saw handy to take care of it. Take note that it does not stop at simply buying a recipro saw and cutting away at the material you want to get rid of. There are a lot of things to keep in mind in order to achieve your preferred results. Do you need a high-speed saw or is a low-speed one okay? Is it necessary to have variable speed or are you going to be fine with fixed speed saws? To put it simply, reciprocating saws are for people who understand what they are used for and know what the numbers mean in terms of applications. Amperage is power. If you will mostly be using your reciprocating saw for a few small projects here and there around the home, you will be fine with less than 10 amps. For one-time, big projects, a 10- or 11-amp recipro saw should be able to do the trick. However, if you are a contractor who will be using the saw rather heavily, you need to get the most powerful saw you can find--usually 15-amp ones. Recipro saw blades can be straight (moves back and forth) or orbital (moves elliptically). Straight saws are ideal for cutting into harder materials while orbital ones are preferred for relatively softer materials. Find a saw with variable speed settings if you will be using your saw for a lot of different materials and cutting operations. Meanwhile, if you think you have very limited use for your saw, you may do well with a fixed speed saw. You won’t appreciate a lightweight recipro saw until you have tried cutting for hours using a heavy one. It is important that you use a saw you can comfortably hold and operate, especially if you do a lot of overhead cutting. The length of the saw’s stroke is what determines the cutting rate and the amount of material taken out at a time. If you are looking to destroy a hulking piece of plaster that does not contain anything important, you can use a saw with a long stroke. On the other hand, if you will be working with thinner materials, you can instead go for saws with shorter strokes. One of the things you will like about the DCS387B is its multi-position blade clamp. This part design allows you to make flush cuts, especially when cutting a pipe flush against a large, flat surface. 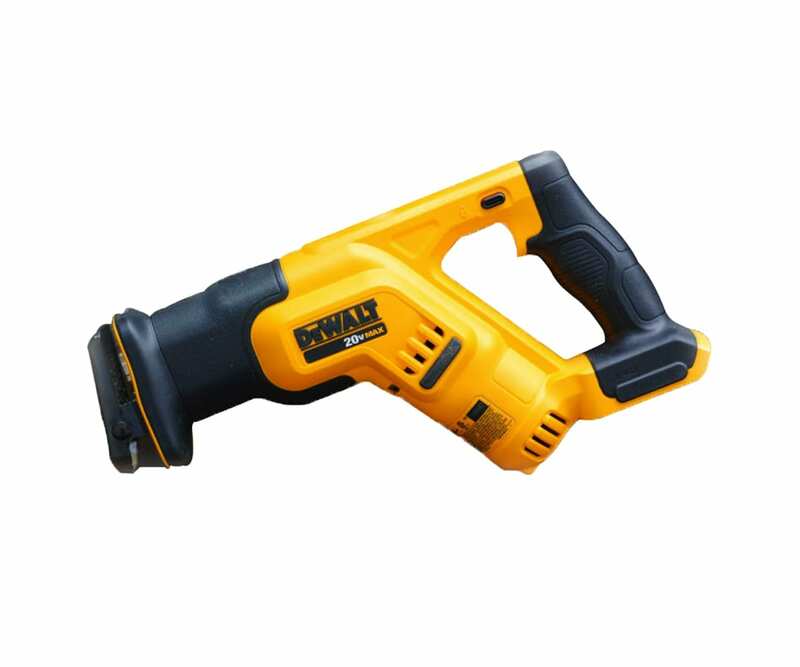 This DeWalt recipro saw has variable speed control with a range of 0-2,900 strokes per minute. It also has an LED bulb that greatly helps in low-visibility worksites. Looking over at the business end of the saw, you will notice a pivoting shoe that helps maintain stability during cutting. Overall, we like how the DCS387B is sleek and compact enough to fit even between studs and other confined spaces. The multi-position blade clamp allows you to install the blade upright or sideways, with the right side up or down, left or right. This gives the saw maximum versatility in terms of cutting application and proves to be very useful when making flush cuts. Variable speed control lets you match your cutting speed with the material you are cutting and helps you achieve the kind of cut you are going for. One hidden benefit of this, though, is extending the saw’s life. By being able to cut dense materials slowly, you are cutting efficiently without compromising the blade. The speed trigger is right on the handle where you can easily press it without having to look anywhere other than the blade. The pivoting shoe comes as a standard design feature in many reciprocating saws today. However, few manufacturers get it right and do it as well as DeWalt does. The pivoting shoe on the DCS387B is surprisingly very stable and durable and manages to remain in contact with the material throughout the cutting operation. This recipro saw is battery-powered, meaning all you have to worry about when taking it out to a worksite is having enough spare. No need to worry about power outlets in the middle of nowhere for as long as you have enough battery juice packed. This time around, renowned tool company Milwaukee offers a nicely designed, compact, and lightweight reciprocating saw that operates on battery. The 2625-20 M18 Hackzall is only 13.4 inches long and 4.4 inches light. Its size allows it to be used comfortably when cutting at difficult angles and areas for extended periods. Its powerful motor is capable of cutting at a variable speed of up to 3,000 strokes per minute with a stroke length of 0.75 inches. The length of the Hackzall’s stroke is just enough to fulfill quick cutting requirements that require relatively more precision. It is also perfect for cutting into thinner materials or those located close to other materials that you can’t risk damaging. Finally, the Hackzall comes fitted with a built-in LED bulb and has a dual-gear anti-vibration system that helps reduce fatigue and improve cutting accuracy. Since the 2625-20 M18 Hackzall is cordless, you are given full maneuverability when cutting. It allows you to cut in tight areas, bad angles, overhead locations, and other places you normally can’t get to with a cord in the way. The other great thing about having a cordless reciprocating saw like the Hackzall is that you can bring it to remote worksites without having to worry about power outlets, bulky extension cords, and heavy generators. You only need to have good batteries in stock and know how long each one lasts so you can prepare beforehand. An anti-vibration mechanism is something you normally ignore until you have tried cutting for long periods of time and endured double the fatigue you usually experience because of a tool’s vibration. In the case of the 2625-20 M18 Hackzall, their dual-gear anti-vibration system makes all the difference. Since the device cushions or absorbs some of that vibration from the tool, you get more stability and accuracy and less exhaustion. The 2625-20 M18 Hackzall is so small and light that storage and transportation should be the least of your worries. You can hang it from your belt and go about your day and not so much as notice its weight. Variable speed control gives you many benefits, including the ability to adjust your cutting speed to the material you are working with (Some materials are better cut at low speeds while some are more efficiently handled at high cutting speeds.). It also gives you full flexibility in terms of cut type or quality (Generally, the higher the speed, the rougher the cut). Finally, this feature also indirectly helps in prolonging the life of your saw. By cutting at slower speeds, you are able to work with dense materials without the risk of overheating the recipro saw. The Hackzall’s speed control trigger juts out from just under the handle, within reach of your finger. The button’s location lets you easily adjust the cutting speed without requiring you to take your eyes off what you are cutting. It is light, compact, and portable. Variable speed allows for flexibility. The LED and the anti-vibration features are nice. A little water can cause it to stall. 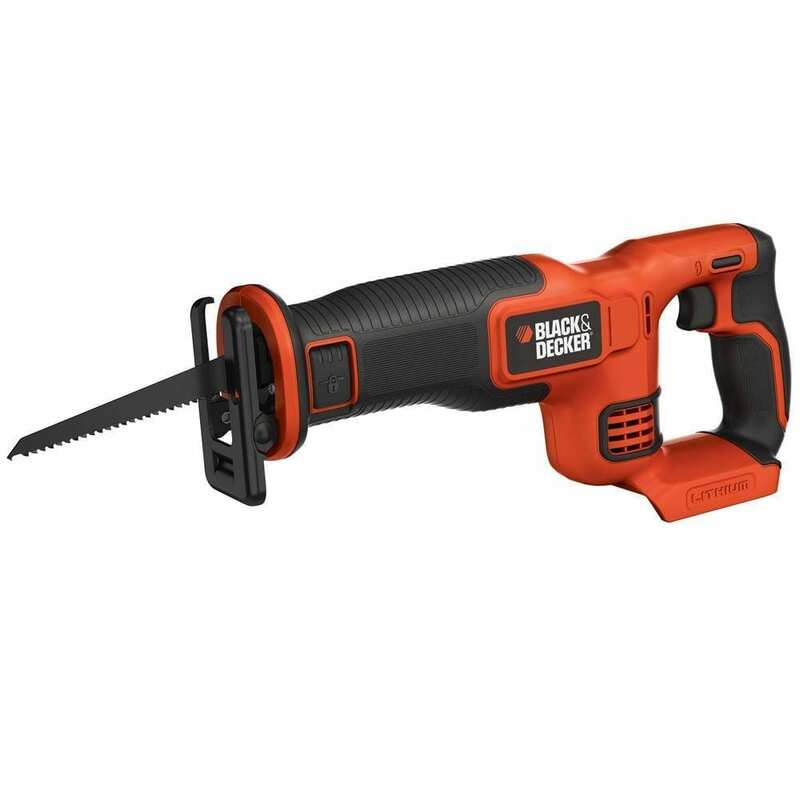 This reciprocating saw from Black+Decker weighs only 3.8 lbs, making it lightweight and portable enough for many of us who have to travel a lot with it. It has a powerful, high-performance motor with a variable speed range of 0-3,000 strokes per minute, with each stroke measuring ⅞ inch. This much stroke length is ideal for cutting through relatively thinner materials or those sandwiched between delicate corners that you do not want to damage. It also has a pivoting shoe and a tool-free blade change system in place, which greatly add to the convenience of using this saw. The other thing we appreciate about this is that it comes with a saw blade, which other bare-tool items do not include. 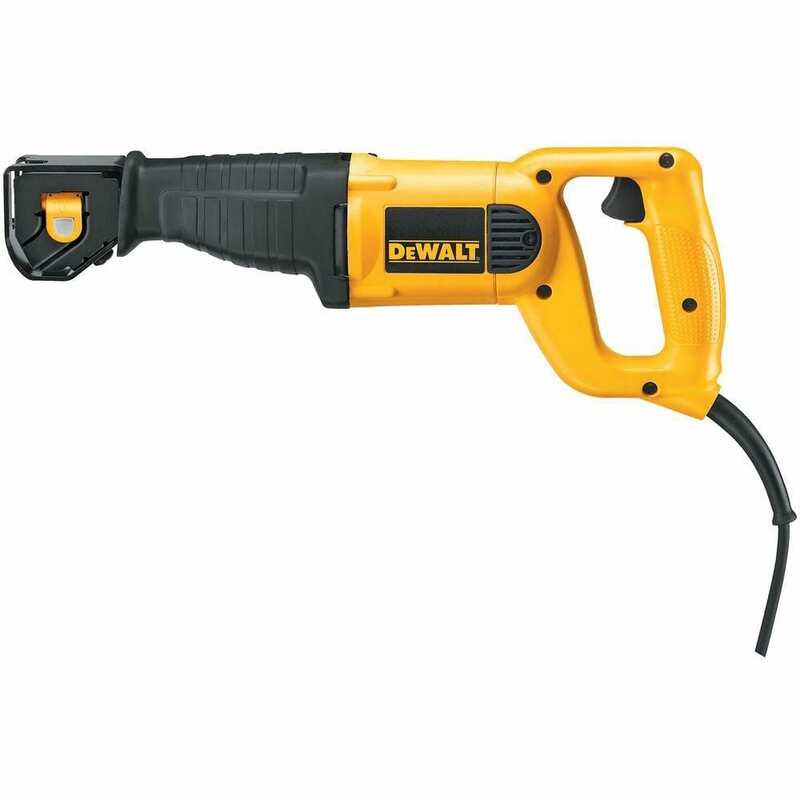 Without a cord, the BDCR20B can get into tight spaces that corded saws usually have difficulty maneuvering through. It is also convenient in that you can use it anywhere without the need for an outlet. With direct access to this unit’s fully variable speed control, you get to quickly adjust your cut. Go faster for a rougher cut or slower for a more precise cut. Changing blades does not require the use of wrenches, unlike other recipro saw models. If you look near the business end of the BDCR20B, there is a lever near the blade mount that you flip open to release the old blade and flip back down to lock the new blade in position. The DWE304 comes packed with a powerful motor and a sturdy body optimized for heavy-duty applications. Like the earlier DeWalt model, this one has a four-position blade clamp design, which allows for flush cutting, among others. It has variable speed control and can cut anywhere between 0 to 2,800 strokes per minute with 1 ⅛-inch strokes. This stroke length combined with a relatively low max speed is ideal for making rough cuts through dense or hard materials. The stroke length makes deep cuts while the low speed limit ensures that the saw does not overheat in the process. Cordless saws are great, but they will never equal the power of corded saws like the DWE304. Furthermore, having a saw plugged in means you never have to worry about running out of battery mid-cut. This model may be a little heavier than the others, but that it for a very good reason. It is made of high-grade materials that are designed to withstand heavy use and abuse. The DWE304 is guaranteed to stay intact regardless of the amount of work it does at any one time. The DWE304 is armed with a relatively low speed limit and an impressively long stroke, making it ideal for making slow, deep cuts in tough materials. The long stroke ensures you get to remove as much material as possible while the low speed prevents the saw from overheating even if you use it for extended work periods. Another cordless recipro saw, the P515 from Ryobi can cut even in hard-to-reach corners. You can use it comfortably even when cutting at overhead angles because it features an anti-vibe handle which reduces the transfer of vibration from the tool to your arm. This delays, if not totally eliminates, the onset of fatigue. Meanwhile, the handle is designed with an overmolded handle with micro texture. This is to optimize it for superior comfort and good grip. It has a tool-free blade change system in place in the form of its uniquely designed blade clamp. Its powerful motor can cut at a speed of 3,100 strokes per minute. The P515 is cordless, making it flexible enough for cutting in confined areas and convenient enough for use in remote jobsites with no electricity. With an ingeniously designed anti-vibe handle, the P515 lets you focus more on your operation than on trying to keep your arm steady and enduring the exhaustion aggravated by the tool’s vibration. What most people seem to love about this saw is its performance, seeing how it cuts remarkably into nearly any material type. Although this DeWalt recipro saw falls within the middle price range, it surely delivers results comparable to those of more expensive saws. Oddly enough, many of the negative comments about the DCS387B are about the fact that it does not come with a battery or a charger. However, we do not want to count that against the saw because they by no means affect the tool’s performance. Overall, the DCS387B seems to be a popular choice among new and experienced workers alike because of its versatility and top-notch features. The DCS380B has a multi-position blade mount that allows for flexible positioning of the blade. The strokes are 1 ⅛ inch long and delivered at a variable speed range of 0-3,000 spm. Its pivoting shoe is also adjustable, making cutting more stable and giving you more control over the cut depth. Milwaukee claims to have put the power of a corded saw into the 2720-20 M18 Sawzall. This unit has a brushless motor that helps reduce heat, prolonging the tool’s life. It has a built-in overload protection in the form of total communication among the battery, the charger, and the tool itself. Finally, it boasts a Redlithium XC 4.0 battery pack, which delivers superior performance. Makita’s corded saw is ideal for making powerful and fast cuts on dense materials. In addition to good performance and high power, this unit has some ease-of-use features such as the tool-free adjustment system for the shoes and the blades. It has got its own back as well, having a ball and needle bearings which help extend its life. The PC75TRS has a super comfortable overmolded handle and clamshell boot which give the operator a good grip and superior control. It can cut up to 3,200 strokes per minute, an impressive number compared to most recipro saws on the market today. We recommend this model for heavy-duty cutting purposes as it is powerful but can be a bit heavy. This reciprocating saw from Skil is housed in a strong and sturdy metal body, which prepares it for rugged use. It aims to take care of the usual vibration problem with its Counter Balance feature while its 7.5-amp motor produces the right kind of power for moderate cutting applications. Finally, you also see the usual add-ons such as the pivoting shoe and the tool-free blade change mechanism. Black+Decker redefines compact with the LPS7000. Despite being so small and light, this saw can cut wood up to an inch thick and has a battery that can stay charged for up to 18 months. It is convenient to use because it has a keyless blade change feature which allows you to switch positions quickly. It also has a nice built-in LED and comes with a blade and a charger. The 6509-31 has a variable cutting speed range of 0-3,000 and a stroke length of ¾ inch. This combination of features makes this unit ideal for use when making anything from rugged to relatively precise cuts on materials of moderate thickness. It has a unique self-protection feature in the form of a gear protecting clutch, which absorbs impact caused by blade lock-ups. Astro designed the 930 recipro saw mainly for applications involving automotive repair and related operations. This saw is optimized for cutting through all kinds of plastic, sheet metal, aluminum, and fiberglass. It has a fixed cutting speed of 9,000 strokes per minute. The RS7 has a fairly powerful 11-amp motor that can cut at a variable speed of up to 2,700 strokes per minute. Its stroke measures 1 ⅛ inches long and is capable of removing a lot of material quickly. Bosch also installed a tool-free blade switching system, a grip-enhancing handle, and dual LED bulbs. Porter Cable’s popular Tigersaw is only 14.5 inches long and weighs 3.8 lbs but produces a lot of power. It has a variable speed range reaching 3,000 strokes per minute and each stroke is an inch long. Like many other recipro saws today, the Tigersaw has a tool-free blade change system and a pivoting shoe. Instead of using a combination of different tools to take down various materials during demolition or construction, it’s best to just have a durable and versatile reciprocating saw around for the job. DeWalt’s DCS387B is one such power tool. Flexible, powerful, and boasting first-rate features, it should easily gain the favor of both small-time DIYers and professional remodelers. Click here to learn more about this reciprocating saw.